'Underworld: Blood Wars' is a movie genre Action, was released in November 28, 2016. Anna Foerster was directed this movie and starring by Kate Beckinsale. This movie tell story about Vampire death dealer Selene fends off brutal attacks from both the Lycan clan and the Vampire faction that betrayed her. With her only allies, David and his father Thomas, she must stop the eternal war between Lycans and Vampires, even if it means she has to make the ultimate sacrifice. November 18th, 2013AWM: Updating old AllWebMenus version to the latest. Just wanted to check the procedure after updating my AllWebMenus from 5.1 version 762 to the latest version. I want to limit any work to just compiling the one menu, is this automatic? I have not used the Menu for a long time. I am ready to update, please confirm the compiled menu is supported in Internet Explorer 7,8,9,10 and more. Wishing your team a lot of success and hope you are all on the road to recovery. I confirm that the compiled menus are supported in Internet Explorer 7, 8, 9, 10 , Firefox, Google Chrome, Opera, Safari, generally in all modern browsers. Thank you for kind words, we appreciate this. I'm just at the ordering page and would like to know how can I use the menu on a WordPress installation? You install the AllWebMenus WordPress plugin to your WordPress installation, you choose some settings for the menu, like what menu data you would like to use, the position you want it to display in, the menu type (Dynamic, Mixed, Static) and then you get the code for the menu. You Open the AllWebMenus Pro, you go to Add-ins -> WordPress Menu -> Import/Update Menu Structure from WordPress in order to have the menu structure. You create it in the way that fits your needs and then you compile it for WordPress. This creates a .zip file that you need to upload in your WordPress through the AllWebMenus plugin. Let me know if you need any more further information. 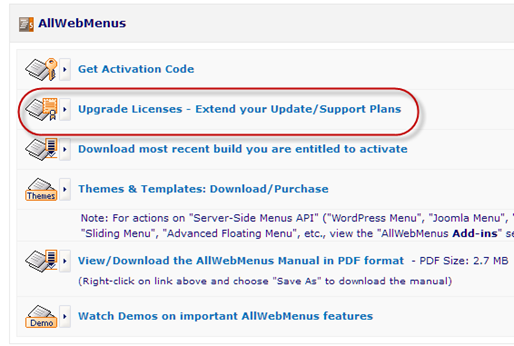 July 19th, 2013AWM: Do I get the latest AllWebMenus when I update my plan? Just double checking on this as (to me at least) it's a bit unclear as to the upgrade to the current version of AllWebMenus. So is it the case that purchasing the 12 month support upgrade for $29.95 will upgrade/update me to the most current version of AWM? And will allow me to continue to receive any additional updates for the next 12 months? This is correct. By extending the Update Plan, you will be able to get the latest AllWebMenus version and any version we release within the next year. July 5th, 2013AWM: After AllWebMenus update it keeps giving the error "Incompatible version of Server-Side Menus API"
I just paid to update AllMenus Pro to Version 5.3.912 on 21 June, which I believe entitles me to some more support. I followed your instructions to activate the software, which appeared to work properly. "It looks as if you have an incompatible version of Server-Side Menus API installed. Please download and install the latest version from ...". I still get the same error message. Please advise me what I should do next. Could you please uninstall the AllWebMenus and then reinstall it? Let me know if it still gives you the error. Uninstalling and reinstalling AllWebMenus Pro seems to have resolved the problem. July 4th, 2013AWM: Does AllWebMenus support Safari 6? I realize my license & support are expired. This is a pre-sales question. If I update to the latest version, does it support Safari 6? Yes, the latest AllWebMenus version supports Safari 6 as well as all the latest browsers and mobile devices.